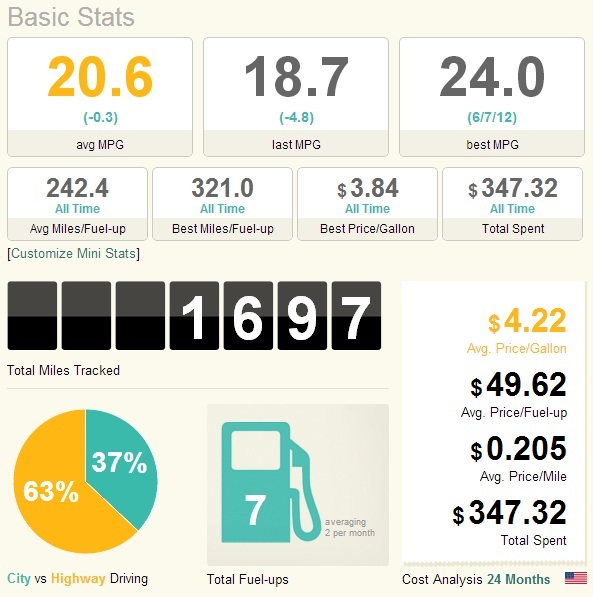 Well, I finally took the plunge the other day and signed up for a Fuelly account to track my fuel consumption. I have been using the DoT/EPA site fueleconomy.gov (fe.gov) for years*, but I've heard and seen quite a bit about Fuelly so I decided to finally give it a whirl. I must say that so far, Fuelly appears much superior to fe.gov. This could be because Fuelly is built around the current trend of social media whereas fe.gov is not. As a result, Fuelly allows you to connect their Facebook and/or Twitter account to their Fuelly account to help share your fuel consumption with your friends. They also make it easy for you to connect to your friends who use Fuelly via messaging and the ability to add friends. I quite honestly do not even recall ever seeing that capability on fe.gov, but I won't say it doesn't exist at all. All of that is possible because of the Fuelly interface. As I mentioned before, Fuelly is built around the current social media trend while fe.gov is a government website. Some may understand what I'm saying based on implication alone, but I'll attempt to explain the differences. In addition to having color, Fuelly has a better organization than fe.gov, making it easier for you to find information. Then besides the aforementioned social aspect where you can track your usage with your friends and even have some friendly competition, Fuelly is also a global site so it includes usage data from users the world over. As a result, not only can you compare your usage to your neighbor Joe, you can also compare it to your cousin Johannes a half world away. In addition to the ability to connect, I also like Fuelly's database access over fe.gov. The Fuelly database is organized by Make with every known Model (that someone has collected data for) listed underneath. It definitely is a bit cluttered, but I still prefer it to the setup at fe.gov because it takes less effort to find a particular car. Especially if that car happens to be one of the top-10 models on the site. Arranged at the top of the list, those cut the scroll time down, something that could be especially helpful on a mobile device. Comparison of the two entry screens. All the social pieces aside, where Fuelly really blows fe.gov out of the water is with the analytic tools. It all starts with the entry interface. 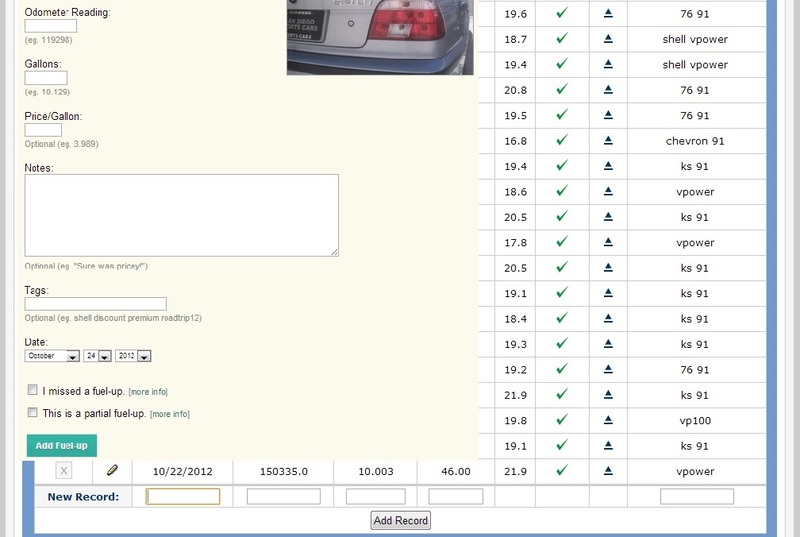 On fe.gov, there's a line at the bottom of your records to put in the date, odometer (or trip miles, depending on what settings you use), amount of fuel purchased, total price paid, and some notes. Fuelly allows all the same information (except they collect price-per-gallon vs. total paid), but I think it is better organized than on fe.gov. They also have a much larger area to write dissertations notes and you can also insert a gap/indicate missed or partial fill-ups on the screen at the same time. On the mobile front, neither has an app, but they both have light mobile sites (fe.gov/m and Fuelly Mobile) for entering fuel purchase information on the go. Their mobile sites are much more comparable, with both having just a couple lines to put in the miles/gallons/price info and notes. On the garage side, the fe.gov site actually has a few more features while Fuelly has more settings. The fe.gov mobile site also lets you look up information on other cars while Fuelly Mobile is only for entering your info at the pump. graphs Fuelly will spit out for you. Now that we have a little background, we can dive into the analytic tools. On fe.gov, you put your information in, they calculate your MPG and show you your running average MPG and how that compares to the official EPA sticker estimates. That's it. If you want to know anything else, you have to download your data (they export in .csv files), open it in a spreadsheet program (e.g. MS Excel), and do the various calculations and graphs all on your own. An Excel 101 class wouldn't be overkill for that task. Meanwhile, on Fuelly, you click the green "Add fuel up" button and magic happens. Going far beyond comparing your usage to the EPA estimates, Fuelly spits out numerous graphs and info boxes with information you didn't even think of considering. I've included a screenshot at right of a portion of the stats they provide. Average miles between fills. Fill that had the best MPG. Multiple graphs of your MPG over various time spans. A running tally of total amount of money spent on gas. You can even arrange the modules to suit your liking on the page. But while none of the fancy gadgets are available on fe.gov, it does shine in resources to help you save fuel. They have numerous videos and tips on the front page about cars that use less fuel, on ways to reduce your consumption via carpooling, ways to save money by finding the lowest prices in your area, ways to keep your car in its top shape, and more in that line of thought. Fuelly also has a list of user-submitted tips, but none of the videos and they're also not organized in any particular order. So in conclusion, if you're a fe.gov user, I'd definitely recommend checking out Fuelly. 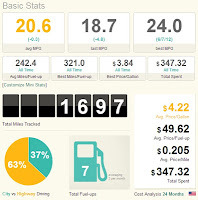 The added analytic tools can really help you hone in on your fuel usage and make tracking it more than just an activity to build the database. If you don't use either, then you should be heading over to Fuelly to sign up right now. They do both lack a bit on a good mobile app, but you can use the mobile site. Also, gas pumps still usually print out a paper receipt so you can write your odometer reading on it. Then after you've started keeping track, don't just blindly keep updating. Pay attention to what the information is telling you. You may very well find a couple extra bucks lying in your gas tank every time you fill that you can use for paying debts, saving, or putting to a better use elsewhere in your budget. *Although I'm now tracking on Fuelly, I'll also still put my information on fe.gov at least for a couple more months to help that database.